Ah, Legos. Have you ever met a kid who doesn’t love them? And have you ever had to empty your wallet to purchase them? Those admittedly awesome and educational toys cost a bundle, and no way is your kid going to stop with just one set. And what parent would want to limit that kind of play? Legos stimulate kids’ creativity, keep them off screens for hours without complaint, and they’re just plain fun. But even if you do have the extra cash to spend on dozens of different sets, do you have the room to store them all? Let’s face it, Legos never really get old – but most kids do enjoy playing with a new set regularly, and they tend to fixate on one at a time. If only there were some sort of Netflix for Legos, where you could queue up sets your kids are interested in, play them for a while, and send them back to await a brand new set in the mail. It’s the perfect solution for parents who don’t have the space or funds to collect every single set that catches their kids’ eyes. Lego rentals are a great idea, and Pley offers just that for parents and caregivers who want a different sort of solution to keeping their kids in Legos. It really does work just like Netflix (the kind where you got the discs in the mail). You simply sign up for Pley and then select your level – there is different pricing for small, medium, and large sets. Once you decide on a size, you can add different sets to your queue from around 250 available. The first set on your list will get sent right out to you in a matter of days, and shipping (both ways) is included in your monthly fee. Once your set arrives, you simply play with and enjoy it for as long as you like. When you’re ready for the next set, you attach the included address label onto the box and put it in the mail to await your new set. You can keep one set for a whole month, or go through several – the fee is the same either way, and it’s really simple to figure out. The Legos themselves come packaged in a mesh bag, which is wrapped in tissue paper (like a present to open), and then packaged in a sturdy box for mailing. All of the pieces are sanitized completely between users, so you don’t have to worry about any nasty germs hitching a ride along with your toys. The mesh bag serves to keep everything contained, and of course you’ll also get the manuals so that you can get started right away on your Lego creations. You even might get a free gift here and there, like the sweet silicone wrist band that arrived with our package – you can attach Legos right to it, a fact that made my ten year old swoon. When you’re finished with your Lego set, it’s a simple matter to pop it back into the mail. Pley asks only that you disassemble all the pieces (to make it easier to ship it on to the next Pleyer), and include all the manuals and pieces that you received. If you’re anything like me, you’re likely worrying right about now what happens if your absented minded child loses a brick or two. Thankfully, Pley has accounted for that rather likely occurrence as well. You won’t be penalized if you misplace a piece or two, so no worries on that front. 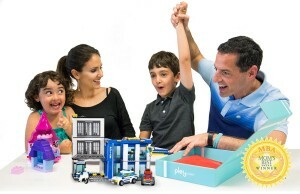 For parents looking for another solution to their kids’ Lego obsession (or for awesome grandparents looking for a truly unique gift), Pley offers a really clever service to families who just love the look of a new Lego set. Kids can choose as many sets as they like, play with them for as long as they like, and then just pop them in the mail to await a brand new set. The set monthly fee means you won’t have to worry about extra charges if your kids go through three or four in a single month, and the included shipping means you won’t have to worry about any hidden fees. It’s a surprisingly simple solution that your family will love. You can check out Pley (and sign up for a free trial) here.